Chennai based Bharata Natyam dance Guru and Choreographer Madurai R Muralidharan had promised (Indian Newslink, May 15, 2016) that his latest dance musical ‘Avathara Purushan’ (‘Avatar of an Ideal Man’) would be of high quality as his earlier productions. He did not disappoint his audience. 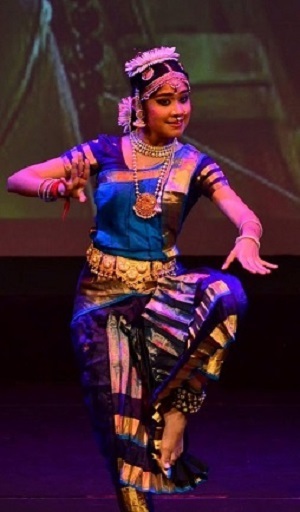 Organised and presented (on Sunday, May 22, 2016 at Dorothy Winstone Centre, Auckland Girls Grammar School) by Renuka Katheesan, Director and Principal of Auckland based dance school ‘Sai Natyalaya’, ‘Avathara Purushan’ was based on ‘Kamba Ramayanam’, the Tamil version of ‘Ramayan’ written by the poet Kambar, who lived in the 12th century AD. More than 65 artistes took part in this production, some of them just five years old. Most people are familiar with Valmiki’s version of ‘Ramayan,’ who penned the original work in Sanskrit. However, Mr Muralidharan, inspired by Broadway and Shen Yun musicals (in New York) along with his love for dance and expertise in Tamil, combines the three elements to create dance musical productions, bringing pride and joy to Tamilians not only in India but also throughout the world. ‘Avathara Purushan’ was based on his ‘Kamba Ramayanam,’ staged at the same venue under the ‘Nrithyabhinaya,’ banner, popularly known as Anuradha’s School of Indian Dances on May 12, 2007 (Indian Newslink, May 15, 2007). This is an essentially new and improved version of the former, with pre-recorded dialogues forming part of the musical and renowned musicians from both Carnatic and Hindustani disciplines participating in this project, such as Veena maestro Rajesh Vaidhya, and Sitar expert Alka Gujar. The digital backdrops were also something new in this venture, with computer graphics cleverly incorporated with the live happenings on stage, an impressive one being Lord Hanuman (Muralidharan) flying across the sky to meet Sita. Other noteworthy moments included performers emerging from the audience, giving the overall production a 3D effect and sense of involvement of the latter. This was of course possible due to the design of the venue, which is ideal for such programmes. 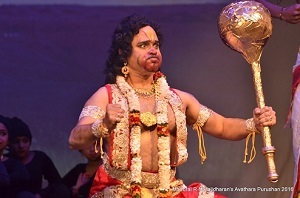 Besides conveying the seriousness of ‘good over evil’ and ‘victory over defeat’, and the main purpose of vanquishing Ravana (played by Vethahi Arunthayaparan), the show displayed some light-hearted moments that evoked laughter, particularly in ‘Sita’s Swayamvaram’ (Sita’s bride-groom choosing ceremony). 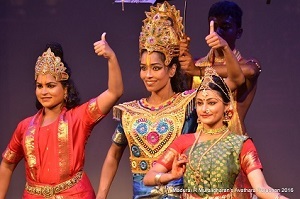 Noteworthy performances by the artistes who were adept in their roles included Sumedha Hariswamy as Sita, Nive Pasupati as Lord Rama, Narme Deva as Kaikeyi and Alexshana Sivarajah as Soorpanaka. 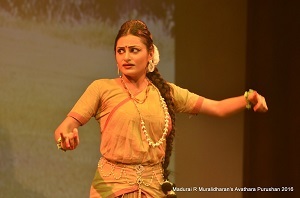 Muralidharan’s disciple and daughter Kavyalakshmi delighted the audience once again with her two solo performances before the commencement of the programme. Those who missed her solo recital on April 30 (Indian Newslink, May 1, 2016) would have been pleased. We look forward to Muralidharan’s next production next year.